Happy Feast of the Guardian Angels! Pray you are having a great day and have spent some time enjoying and acknowledging the gift of your guardian angel! 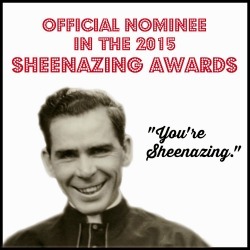 Our Lord truly knew we would need the help of a perfect Heavenly presence all the days of our lives! Especially if you have recently been quarantined due to two little ones who caught a nasty virus (have since recovered fully - Thanks be to God! ), and then were hit with crippling back pain that has also kept you busy at home desperately trying to heal/attending doctor appointment after another/and throw in a procedure (as the doctors call it - read: shot to your spine. ), and you can guarantee there will be some real need for some Heavenly intervention to counter my every bit of stir-cray-cray. 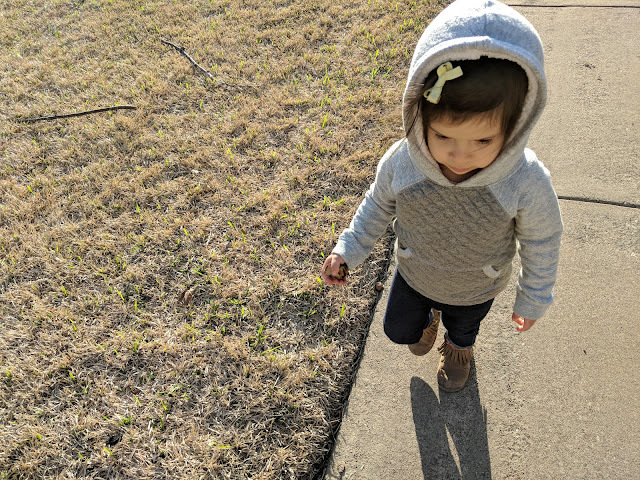 These days have been every bit of good as they have been hard. 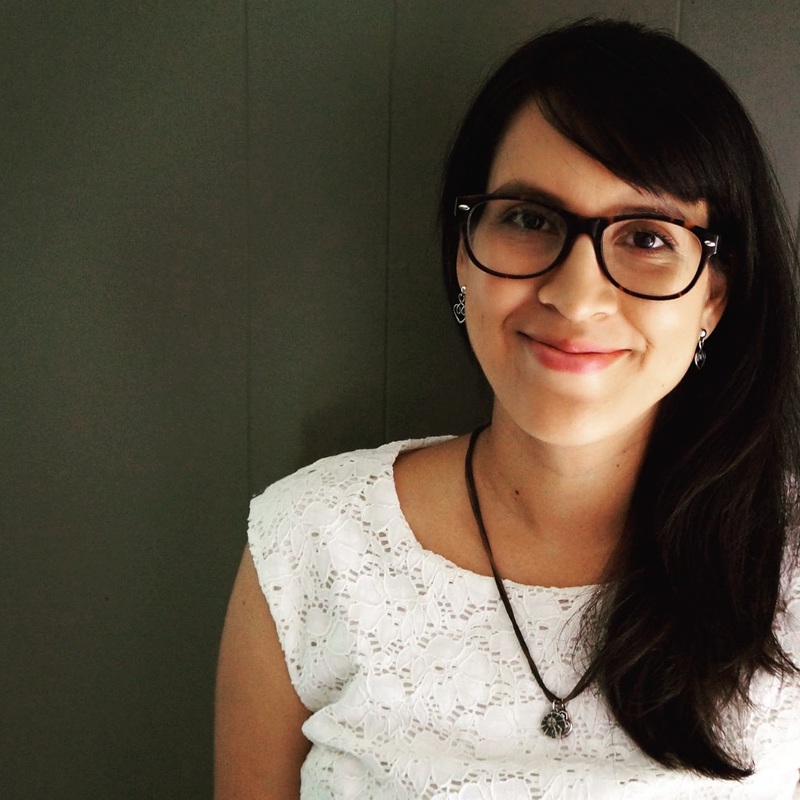 With lots of Grace and (I know!) 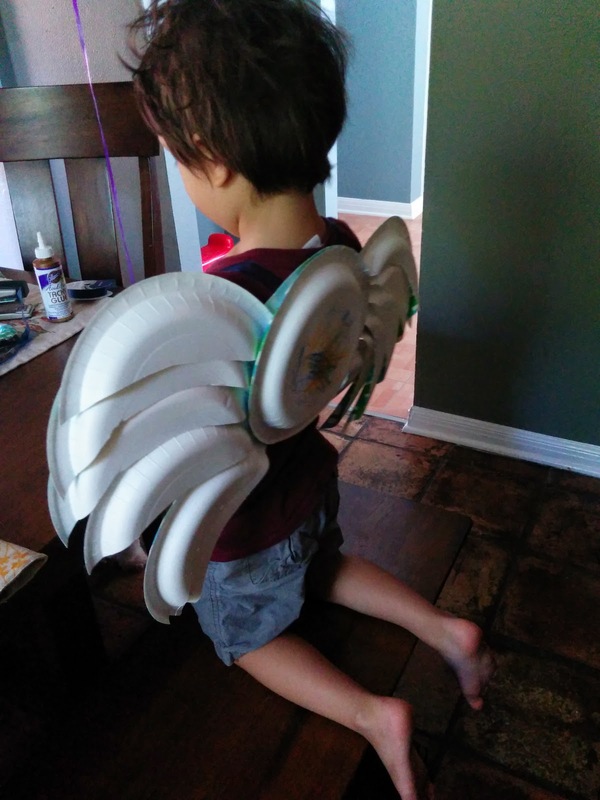 the help of my amazing Guardian Angel, have we been doing well enough to crank out some fun, laughter, with a side of Angel wings for Toddlers. So, here I am, thanking my dear Guardian Angel and sharing a little craft time we enjoyed as well as some beautiful words from St. John Vianney on the gift of these amazing celestial beings! Our Guardian Angels are our most faithful friends, because they are with us day and night, always and everywhere. We ought often to invoke them. The Angels take great pleasure in helping us with our enterprises, when they are in accordance with God's will. 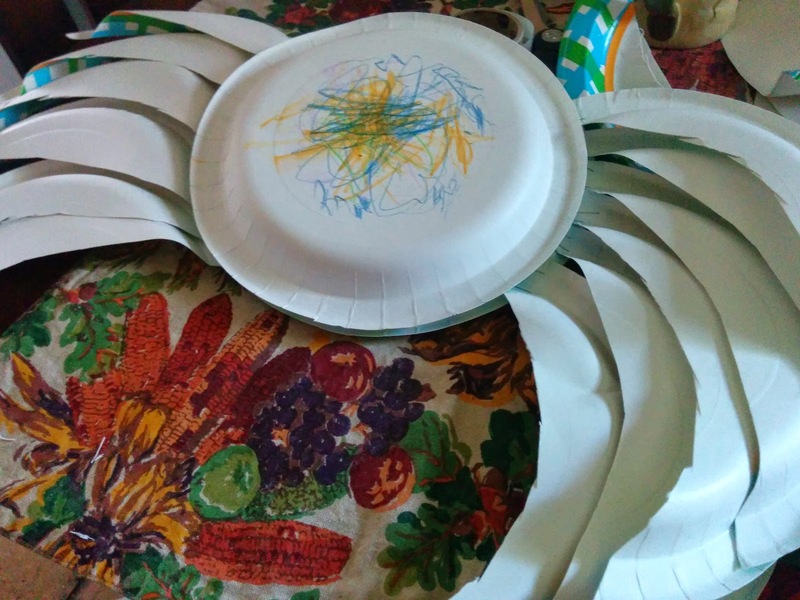 First, I got the boys coloring their plate that would be the visible one on the back. 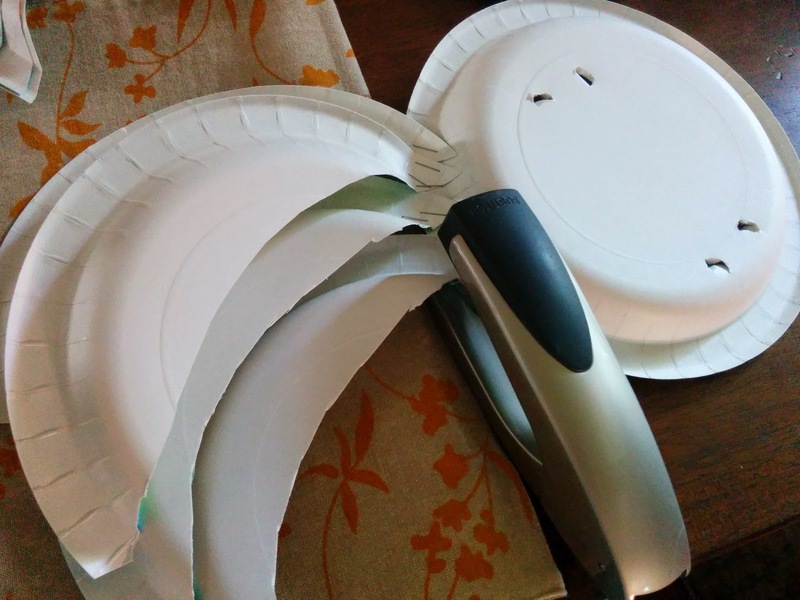 Meanwhile, I went to town cutting the sides of paper plates and stapling them layer by layer onto a different plate which I roughly cut wholes in for ribbon straps. 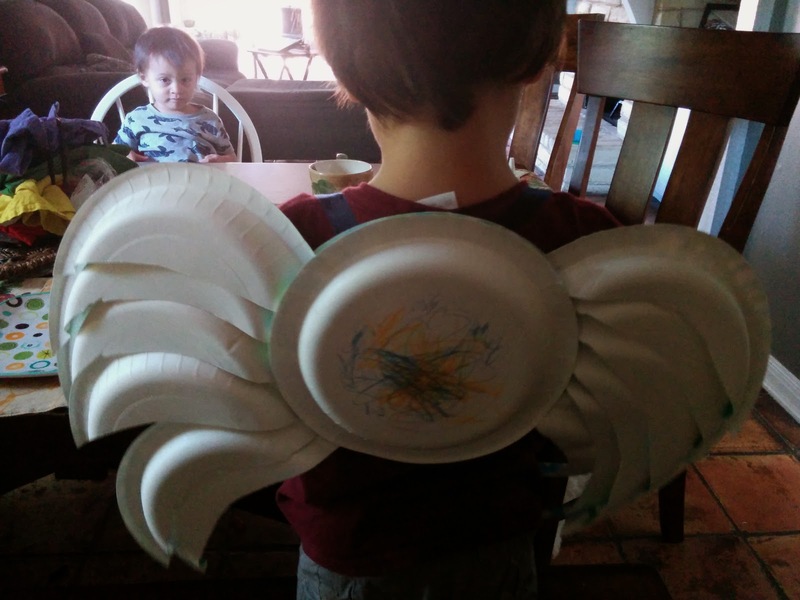 When I say, I went to town on this, it's because I knew I had to make two set of wings, and if you know my boys, you know that they enjoy coloring for a good 2 minutes. On and on I went. 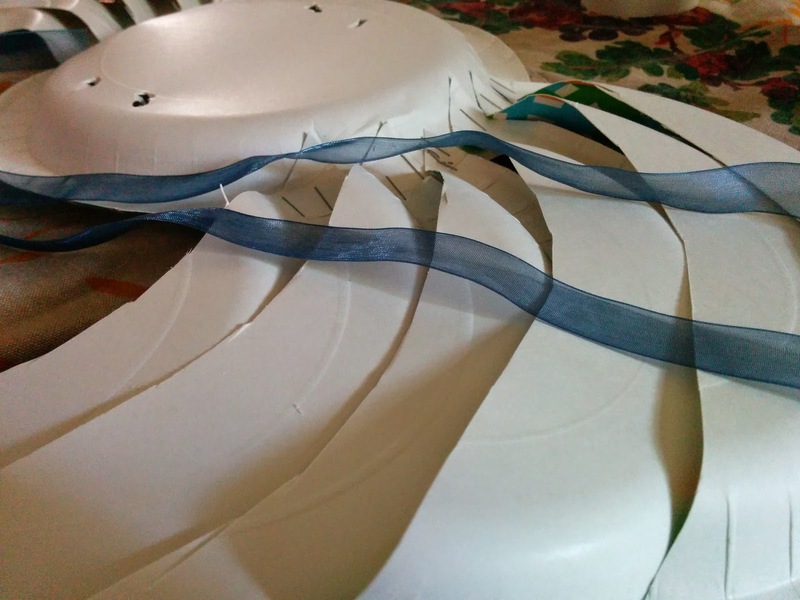 Tied the ribbon through the wholes to make straps after having carelessly stapled feathers to the sides of a plate. 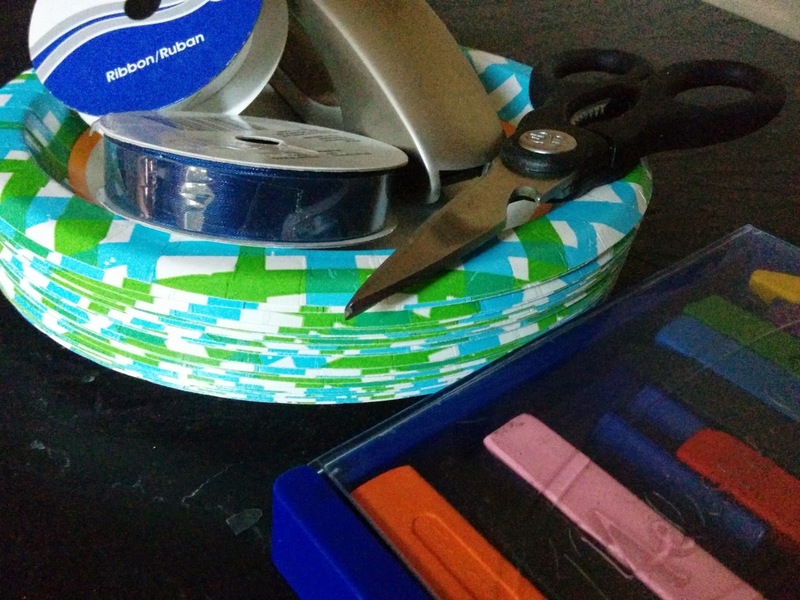 Once I finished my part, I grabbed the plate that was being colored on and placed it on top of the ribbons and all those careless staples. 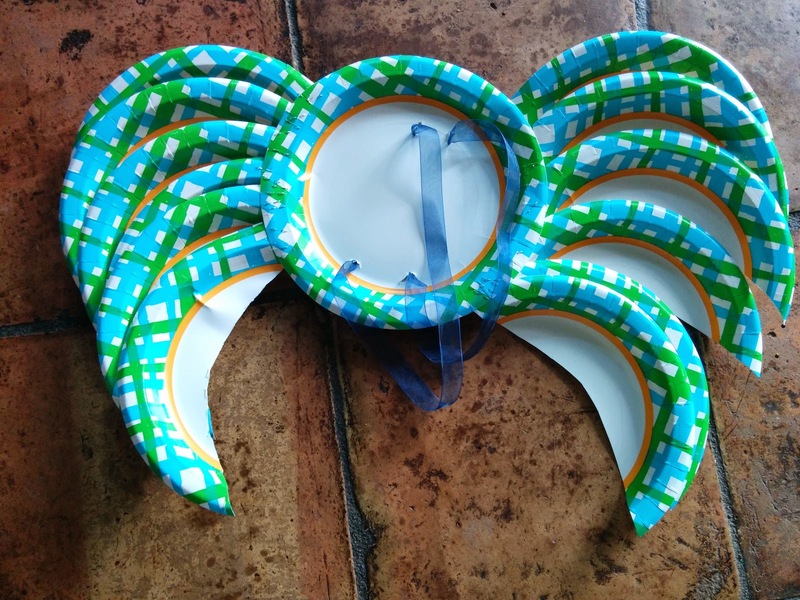 I used my trusty glue dots (These things are uhmazing for toddler crafts!). Glue dots Forever!!! And there you have it! 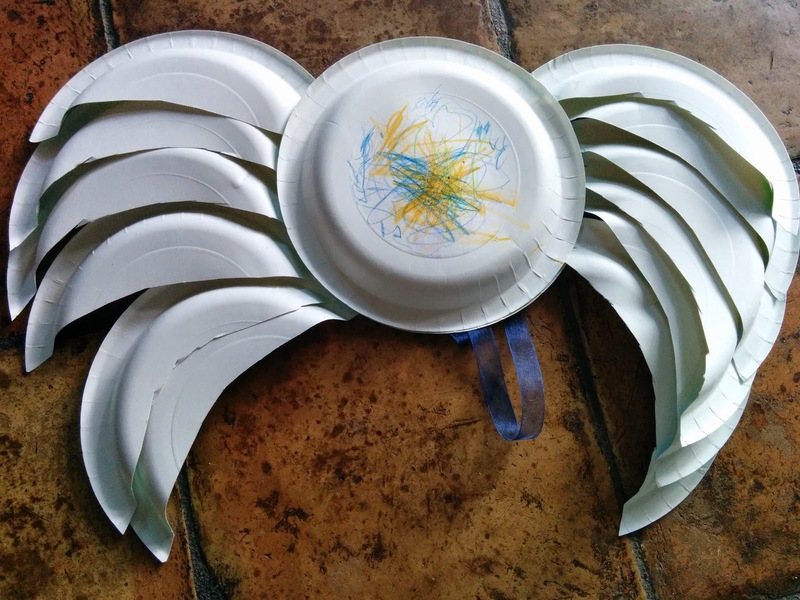 Angel Wings for your little toddlers to fly around in. See that wing action above? 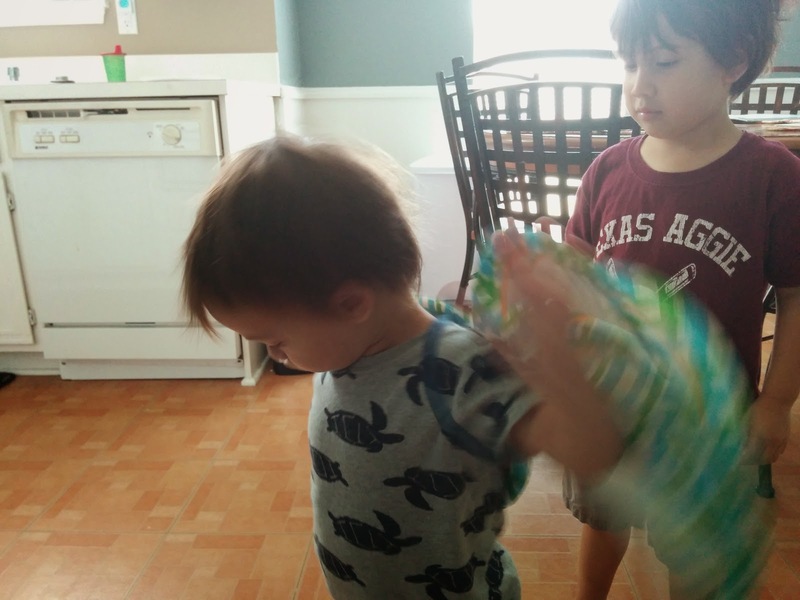 He was really flailing around to try and get them off. The plates we used had fun prints on the front which added a bit of piz-zazz. 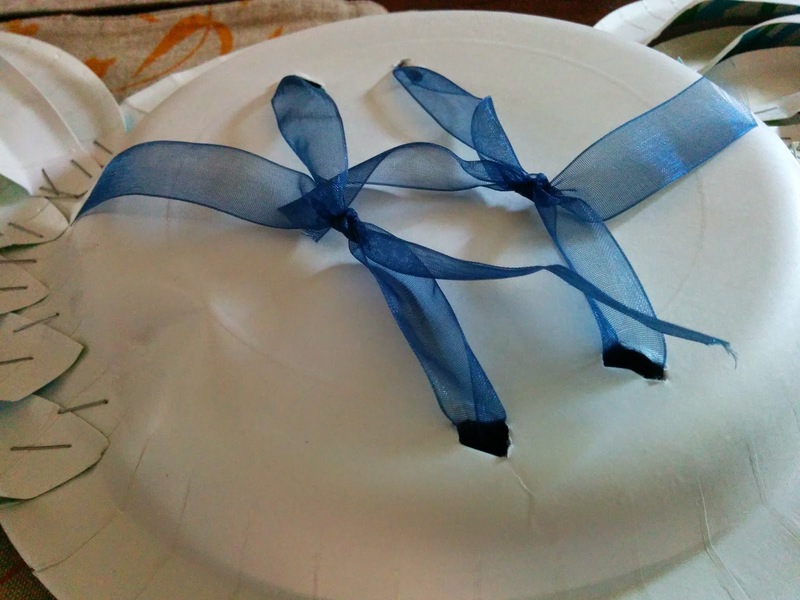 And, our trusty leftover ribbon from our wedding invitation strikes again for the WIN! 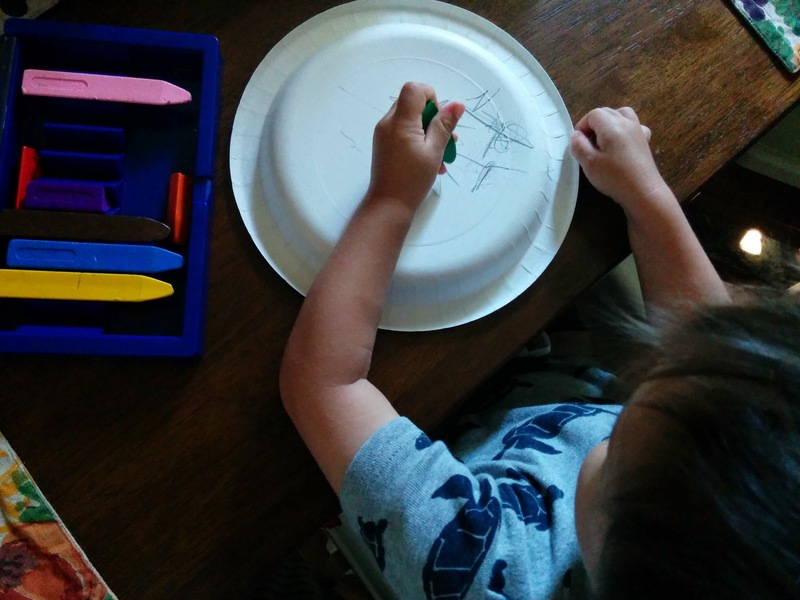 We didn't do this, because my boys most often feel like coloring is punishment, but you could also coax your little ones to additionally color their feathers. Or maybeee, you could use watercolor painting instead of crayons? That may have made the difference for my boys. So, I'll just stow that thought away for next year! Voila! Little angels under my roof. 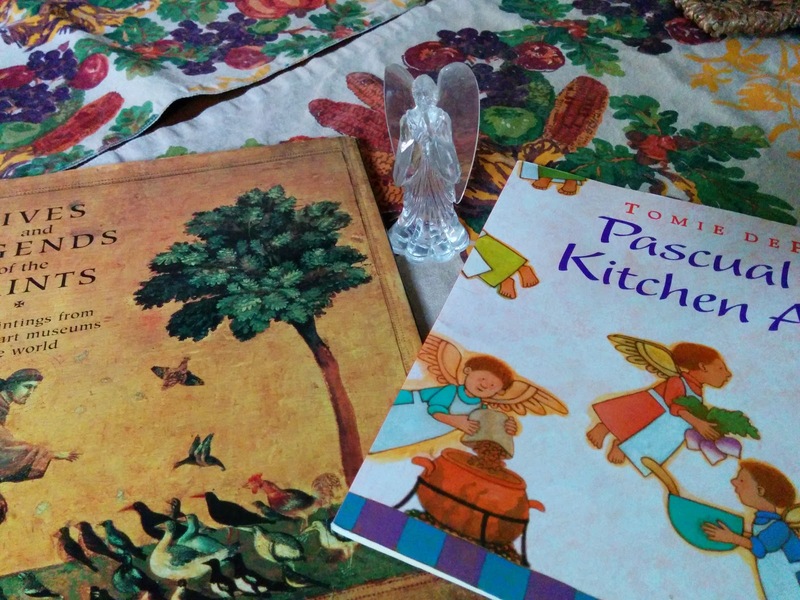 Add in some lovely books on the wonderful Angels of old, some sweet prayer time, and everyone taking a second to thank each others Angels and you have yourself a sweet time filled with Angel love. Any fun plans for the Feast of the Guardian Angels? I really am so grateful for mine. Most especially on my crazy-mama-days, because Lord knows I can't do this all on my own! Thanks, Rosie! Haha, yes, it's like torture. Glad the girls are coming around! Hope our boys will eventually too! It was fun! And, well-made enough to last awhile! Win-Win!